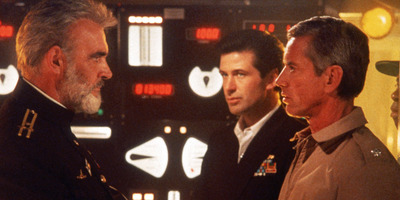 ParamountA still from the 1990 movie ‘The Hunt for Red October,’ which may or may not be a 100% accurate representation of the Cold War. The Cold War may have cost as much as $US8 trillion. The S&P 500 is set to finish October with its worst month since the 2008-2009 financial crisis. The benchmark US index has lost about 8.5% this month, its biggest monthly drop since February 2009. Both the Dow and the Nasdaq have also endured major losses. Concerns including a US-China trade war, the Federal Reserve’s interest-rate policy, and a slowdown in global growth led to a wave of heavy selling. Global stocks have also slumped, with the MSCI All-World Index losing 4.5%. Stocks are bouncing on the month’s final day, however, with the Dow Jones gaining more than 400 points in early trade. Stocks are set to end October having endured the worst month for the S&P 500 since February 2009 and the worst October since the 2008 financial crisis. The benchmark US index is set to drop about 8.5%, outdone by the 16.8% loss the index witnessed in 2008 just weeks after the collapse of Lehman Brothers. The month was plagued by bad news but lacked a clear catalyst. Concerns as varied as a US-China trade war, the Federal Reserve’s interest-rate policy, and a slowdown in global growth led to a wave of heavy selling in the S&P as well as in the Dow and the Nasdaq. October selling was not limited to the US, with Chinese stocks plummeting and the MSCI All-World index dropping about 10%. In the US in particular, the biggest concern for investors is that after years of monetary stimulus and a short-term boost from the Trump administration’s tax cuts, more interest-rate increases and lower bond prices will ultimately bring the US economy to a halt. Growth is still going strong, but many believe that will flip soon, particularly when factoring in the potential negative impact of President Donald Trump’s trade war, which by some measures is already starting to hurt the domestic economy. Another factor for the markets is the slowing Chinese economy, which after a decade or more of blockbuster growth is reaching maturity, bringing with it smaller increases in gross domestic product. Debt levels in China are also huge, another major concern for many in the markets. China’s account balance is down significantly from last year’s 1.3% and is likely to turn into a small deficit in 2019. If so, that would be the first time in 24 years. “The larger the stimulus used by China to offset the trade-war impact, the bigger will its deficit likely be,” Tao Wang, UBS’ chief China economist, said in a report earlier in the month. That may hurt confidence and hasten outflows, putting pressure on the nation’s currency. “Although CNY depreciation can partially offset trade war impact, a large depreciation will likely hurt domestic confidence, trigger panic outflows and risk financial stability,” UBS said, using the abbreviation for the Chinese yuan. The tail end of October has seen an additional negative driver, particularly for the Nasdaq, as disappointing earnings reports from the US tech giants Amazon, Google, and Snap helped to further drag down sentiment. Oil prices are also a major concern, with the combination of looming sanctions against Iran, and the possibility that Saudi Arabia will choke output in response to international outcry over the killing of the journalist Jamal Khashoggi in the country’s consulate in Istanbul, leading some to believe prices could ratchet higher in coming months. High oil prices tend to stunt economic growth, particularly in developing markets where increasing oil consumption is a key driver of rapid growth. Brent traded as high as $US84 a barrel in early October, and while it has now fallen about 9% to $US76 a barrel, that remains an elevated level compared with the past four years. Though stocks have witnessed a horror month, they are bouncing on October’s final day, with the S&P 500 up 1.3% after an hour and a half of trade, and the Nasdaq up 2.18%.